Karbon users receive a Triage notification when a new comment is added to a task they are involved with. If you are an active participant in a task comment thread, are mentioned by another colleague, or you are the task's assignee, you will be notified in Triage of any comments on that task made by a colleague. 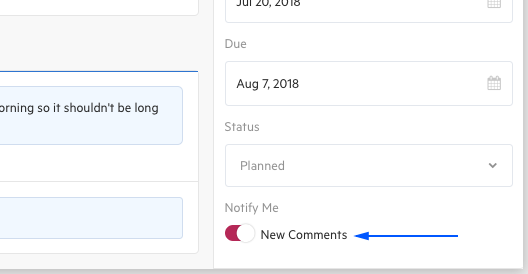 Clicking the notification will expand it, providing you with the task's complete details and the option to respond back to the comment. The information tray to the right of a task includes a toggle that lets you choose whether you are notified of future comments or not. If you turn notifications off, you will still be notified when a team member mentions you.